The best and longest lasting way to replace a missing tooth is with a dental implant. Teeth can be lost due to extensive decay, failed root canals, root fractures, accidents and periodontal disease. Regardless of the reason why a tooth is lost, the gold standard to replacing a missing tooth is with a dental implant. Dr. Nugent’s dental practice is focused on General, Cosmetic, Implant and Sedation Dentistry and is located at 3421 Burke Rd Ste A, Pasadena, Texas. Dr. Nugent serves Pasadena, Deer Park, League City, La Porte, Webster, Friendswood and Clear Lake. Replacing a missing tooth with a dental implant is the best way to restore a lost tooth. A dental implant does not damage adjacent teeth like bridges or removable dentures. No destroying good natural teeth to place a dental bridge and no metal clasps for removable partial dentures. The forces of chewing are transmitted down the tooth into the bone. The bone requires stimulation in order to remain healthy. When a tooth is lost the supporting bone rapidly disappears. A dental implant is the only way to prevent both bone and gum tissue loss. Old fashioned treatment options like bridges and partial dentures do nothing to preserve bone. A dental implant mimics a natural tooth and is designed from the root up. Therefore, one brushes, flosses and cleans a restored dental implant just like natural teeth. Cleaning bridges and partials take extra and often difficult steps. Bridges most often fail due to the support teeth getting cavities or failed root canals. Dental implants are made out of titanium and will never get a cavity or need a root canal. 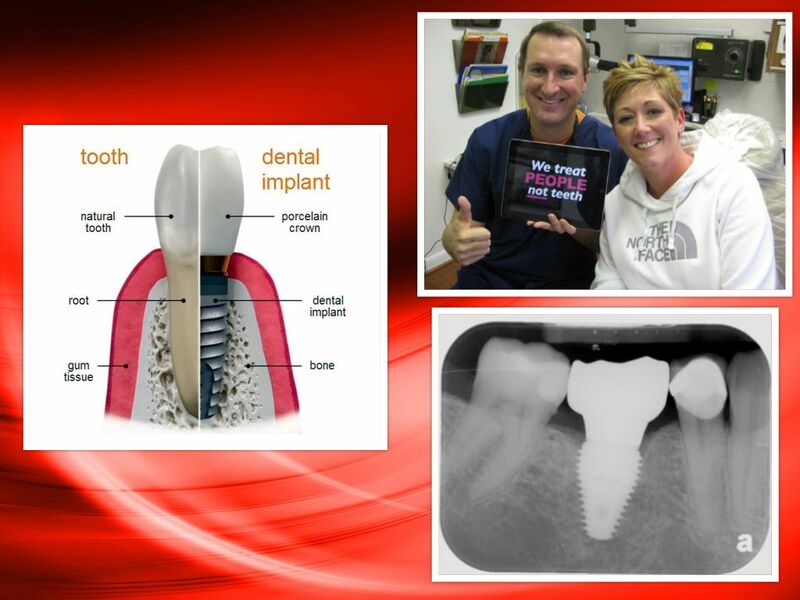 Dental implants look, feel and function just like natural teeth. 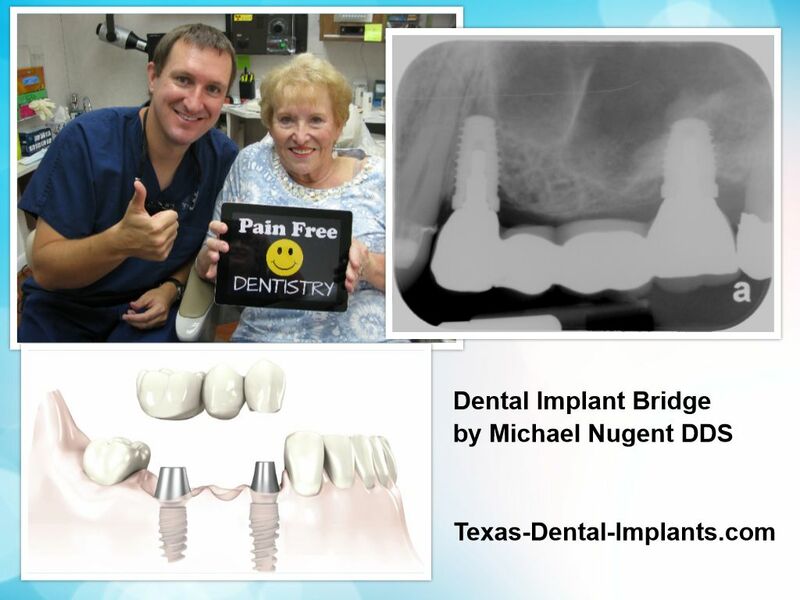 Let Pasadena, Texas Dentist Michael Nugent show you the many advantages of dental implants. With age and use teeth are more susceptible to decay, fractures, chipping, and trauma. However, the need to replace missing teeth is vital in maintain oral and systemic health. Replacing a missing tooth with a dental implant is the best way to restore a missing tooth. Multiple missing teeth can also be restored with dental implants. Each individual tooth can be replaced with a single dental implant or implant supported bridges can be permanently fixed in the mouth. Dental implants look, function and feel just like natural teeth without needing the support of neighboring teeth. Dental implants are placed into the jawbone where they provide a secure foundation for the restoration of missing teeth. The titanium dental implants stimulate and preserve bone levels. 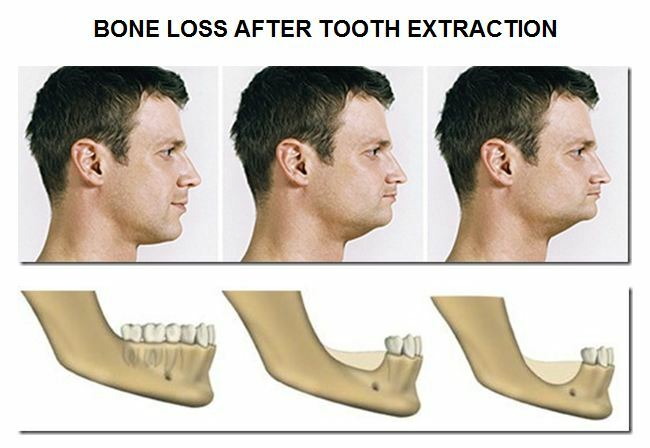 This is very important because when multiple teeth are lost there is a great loss in bone levels. This creates a premature elderly appearance as the facial structures collapse into the mouth. Premature wrinkles and decreased distance from the chin to the nose greatly adds to the premature elderly appearance. What to do if you are already in Dentures? The principle of placing bulky plastic looking denture teeth is hundreds of years old. 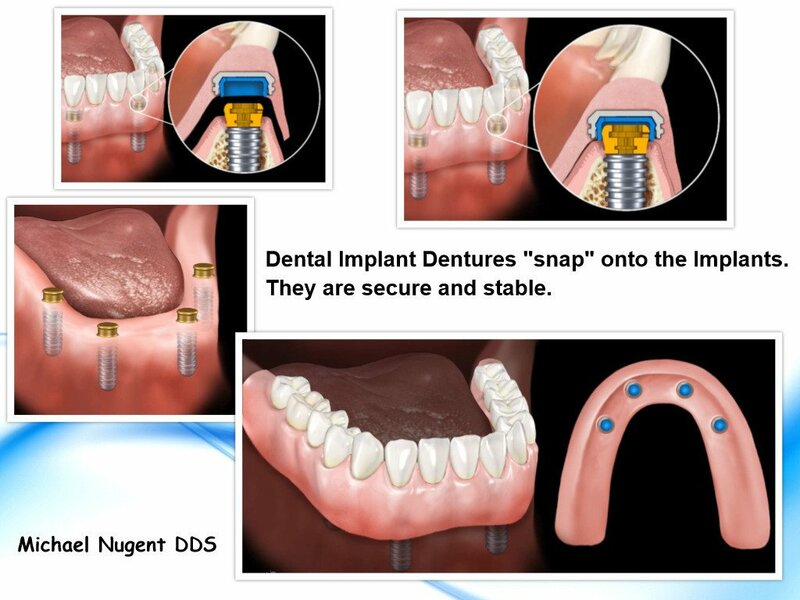 With modern dental implants Dr. Nugent can create dental implant dentures. The problems of loose and uncomfortable dentures are erased. The dental implants are secured into the jawbone where they provide an extremely stable foundation for the dentures. No more messy denture adhesives. 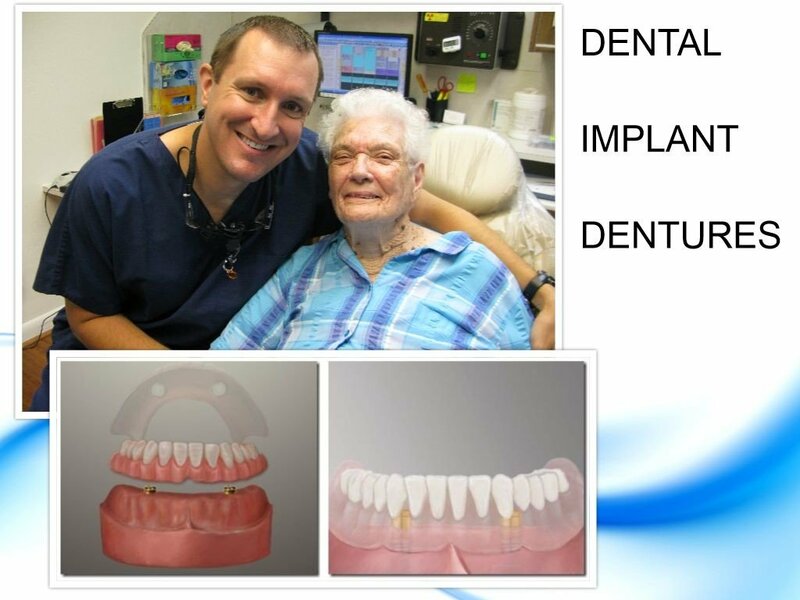 Dental implant dentures fit and look great. Patients have restored self-confidence because their dentures are extremely stable. Dental implant denture patients can eat the food they avoided with their old fashioned dentures. Dental implants are the most technologically advanced way to replace missing teeth. Demand the best in dental care. Do not settle for out dated and old fashioned dentistry. Let Cosmetic Dentist Michael Nugent show you why dental implants are the best way to replace missing teeth. Dr. Nugent sees patients from Pasadena, Deer Park, La Porte, Friendswood, League City, Webster, Clear Lake and Houston. Call us at 713-941-8261 or visit us at 3421 Burke Rd Ste A, Pasadena, Texas 77504.